The Federal Aviation Administration awarded about $4.4 million for improvement projects at Wichita’s Eisenhower National and Jabara airports. The money will be used at Eisenhower to improve taxiway lighting and expand areas where aircraft are parked, loaded, refueled or boarded. The airport will also build a new taxiway and buy two rescue and firefighting vehicles. Eisenhower National Airport opened three years ago to replace a terminal that was 61 years old. Jabara airport will receive $471,214 to buy land for approaches. 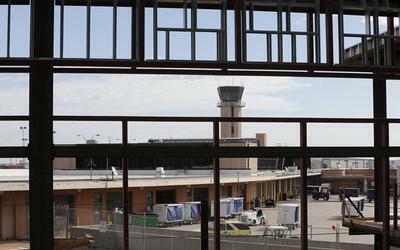 The FAA awarded infrastructure improvement grants to 29 other airports throughout Kansas. “Our airports are essential in supporting $1.6 trillion in total economic activity and nearly 11 million jobs; these federal grants will help our airports to maintain safety and improve efficiency for freight and passengers,” said Transportation Secretary Elaine Chao in a news release. U.S. infrastructure, especially its 3,323 airports and 5,000 paved runways, increases the country’s competitiveness and improves the traveling public’s quality of life. The new terminal at Wichita's Dwight D. Eisenhower National Airport is in its final construction phase, with the official opening expected in May. In the meantime, public events, beginning with this Saturday’s Dedication Gala, will provide a preview of the facility.